Wheatgrass is the sprouted portion of the wheat plant. Unlike wheat, wheatgrass is gluten-free and, as its name denotes, resembles grass. It is found in both wild and cultivated environments. Wheatgrass contains vitamins and minerals and is available as powder, juice or raw grass you can juice at home. Wheatgrass provides a range of vitamins and minerals, while imposing very few calories. Per 100 grams -- about 2.8 ounces -- wheatgrass juice has about 20 calories, 2 grams of carbohydrates and 0.06 gram of fat. Its low calorie content and impressive nutrient profile make wheatgrass an efficient food choice for anyone pursuing a healthy lifestyle. Vitamins in wheatgrass include A, C, E and several B vitamins. The most prevalent vitamin in wheatgrass is pantothenic acid, or B-5. A 100-gram serving of wheatgrass contains 6 milligrams, a full milligram over the suggested 5-milligram daily intake. Pantothenic acid has many roles in the body, including breaking down and converting fats and carbohydrates into energy, maintaining digestive health, and assisting in the production of red blood cells and hormones. Iron, zinc, magnesium, potassium, phosphorus, calcium, sodium and selenium are all present in wheatgrass in at least trace amounts. A serving has 24 milligrams of magnesium, about 8 percent of the recommended dietary allowance for women. Magnesium helps oxygenate blood and keep energy levels high. One serving also has 147 milligrams -- about 3 percent of the RDA -- of potassium, which helps maintain the body's water and electrolyte levels while also protecting heart health. Researchers from the Israel Institute of Technology studied wheatgrass's potential to help with ulcerative colitis, a condition that causes chronic inflammation of the large intestine. Participants in the study consumed either a placebo or just over 3 ounces of wheatgrass juice daily for a month. 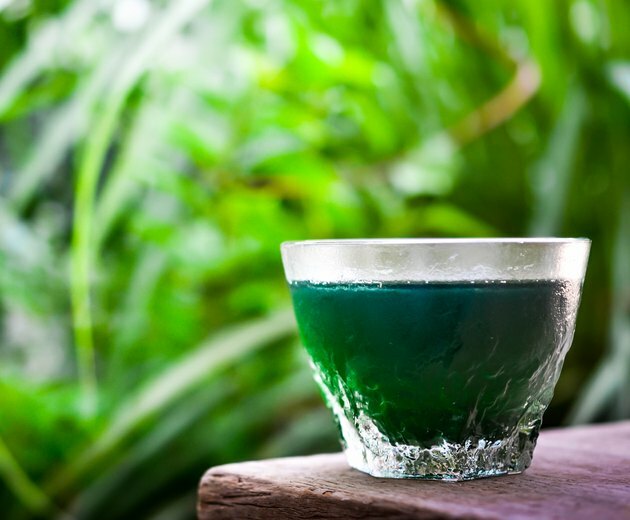 Results showed participants who consumed wheatgrass experienced reduced symptoms. The results of this study were published in the April 2002 issue of the "Scandinavian Journal of Gastroenterology."